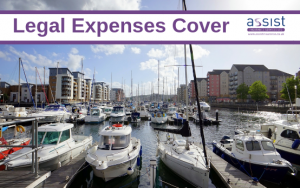 Why opt for legal expenses cover in your marine insurance? The policyholder contacted the legal helpline after they were pursued for the non-payment of a loan taken out in their name. Our specialist legal insurers reviewed the case and determined the prospects of the claim being successful as over 51%, so they agreed to instruct a panel solicitor. The panel solicitor successfully proved that the policyholder had not taken out the loan and that they had been a victim of identity fraud. They contacted the loan company, who agreed not to pursue the policyholder any further. All legal costs were covered under the legal expenses insurance policy. The policyholder sold a high-end computer to a third party (but this could apply to any high-end good). Upon receiving the computer, the third party claimed it was faulty and requested their money back, with threats to take legal action. The policyholder was adamant the computer was in good condition when it was sold and our specialist legal insurers agreed to instruct panel solicitors to negotiate on behalf of the policyholder. The legal insurer had reviewed the case and determined the prospects of the claim being successful to be over 51%. The solicitor contacted the third party to discuss the claim. The third party immediately agreed to withdraw their allegations and the dispute was settled out of court. All legal costs were covered under the legal expenses insurance policy. The policyholder’s wife was employed by an estate agency chain as a branch manager. Over a period of 18 months she was subjected to sustained criticism from her line manager, which made her feel that her position had become untenable. As a result of this, she resigned and contacted the legal helpline in order to submit a claim for constructive dismissal. Our specialist legal insurers instructed solicitors to act for the policyholder after attempts to settle the dispute at Employment Tribunal were unsuccessful. The solicitor was able to negotiate an agreement with the employer securing a cash award, her company car and a reference. All legal costs and disbursements were covered under the legal expenses insurance policy. It’s a very small price to pay for peace of mind for a year. To add legal expenses insurance, when you buy or renew your marine insurance policy, contact our marine insurance team on 01604 946779. To stay up to day with news from Assist Insurance, you can follow us on Twitter, Facebook and LinkedIn.